You've enjoyed French food and wine at home. You'll be surprised and delighted to find the great variety and appeal of regional cuisines all over France. French cuisine is believed by many to be the best in the world. Because France is a fertile country of many rivers lying in a variety of climate zones. From the palm-lined shores of the Mediterranean to the icy heights of Mont Blanc, France has every sort of habitat for raising high-quality ingredients, and 3,427 km (2,130 miles) of seawater coastline for fruits de mer. Visitors to France are in for a treat because the "French cuisine" they know at home is only part of the pleasure. The regional cuisines of France offer many more delights. Why is French cuisine so good? They have the best ingredients. 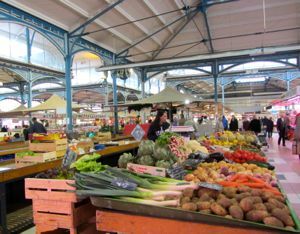 This is the produce market in Dijon.